I absolutely love entertaining. I would throw a party every week if I could. Unfortunately, I don’t have enough time (or money!) to do that. Thankfully, there are countless ways to throw a great get-together without spending a lot of money. I avoided expensive cheeses. If you are on a budget, stick to less costly (but still tasty) cheeses. The book is as amazing as it sounds. It is full of easy homemade cheese recipes that are categorized by easy, easier, and easiest. This fromage facil took about 20 minutes to make, start to finish. It was delicious. Very mild and creamy. I will absolutely be making this cheese again. I would highly recommend checking out this cookbook if you are interested in making your own cheese at home. This is the entire spread (below), which ended up being way too much for five people. Truth be told, I ended up spending more on my party because I made a few extra items: homemade Irish soda bread, a Brie cheese appetizer, sangria slushies, and some watermelon. The salami crackers served as sort of an alternative cracker on the cheese plate. They couldn’t be easier to make. Simply place salami slices in a frying pan over medium-high heat. Fry salami slices for a couple of minutes, turning half way through. Press down on any “bubbles” that form during frying to ensure even cooking. 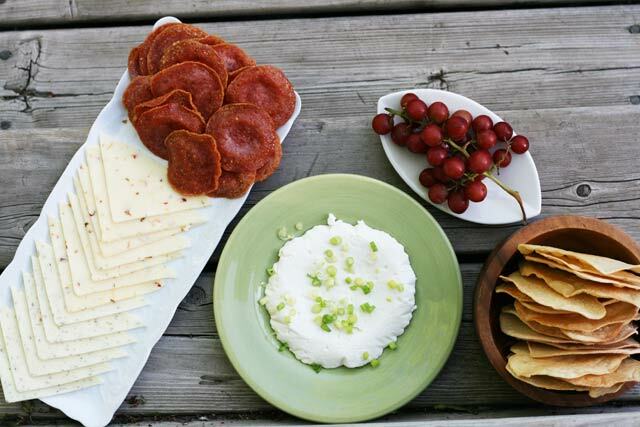 The salami crackers are crisp and stand up to dipping. Check out my previous post, where I prepared a huge cheap appetizer spread for $10. Easy ways to create a great appetizer board or veggie platter without spending a lot of money. This cheese plate looks great! I like to make labneh, or yogurt cheese, for a cheap & tasty option–just drain plain full-fat yogurt in a fine-mesh nylon sieve overnight, season with some pepper and maybe herbs, and you have a soft, spreadable cheese. I’m super interested to check out that cheese cookbook too! Ooh, the labneh sounds intriguing. I may have to give that a try, since I’m on a cheese kick anyway!